What do the green lights on a cell booster mean? Not what you think they do. 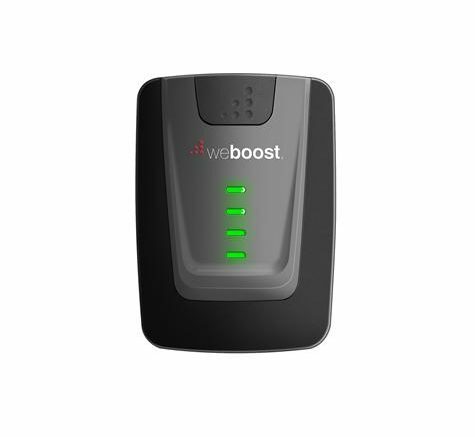 If you look at this weBoost Home 4G booster, you’ll see the four green indicator lights on the front. You would think that if you see all green lights, you would be getting excellent boost and problem-free cell service. You’d kinda be right, but you’d kinda be wrong. The green lights mean there isn’t a problem. They mean the booster isn’t interfering with any cell towers, that it’s not feeding back on itself, that there isn’t some sort of short in the cabling. It doesn’t mean you’re getting better cell service. And I know, this does not make a lot of sense. But I say again, there is no indicator on a cell booster that tells you whether it is actually doing anything. There’s nothing that says what the level is before the booster was turned on or what the level is now that it’s actually plugged in. The booster knows, at least it knows enough to know that it’s not overloading the cell tower or itself. It’s perfectly possible to have all green lights on a cell booster and still have no improvement in coverage, and it’s also possible for a cell booster to do its job and you see no difference in the number of bars. So what can you do? There are three common reasons that a booster wouldn’t give you the signal boost you’re looking for. 1. The outdoor antenna isn’t getting any signal. After all, you’re in an area with weak signal, right? As a regular person without a fancy signal meter, you can use your phone to figure out what’s going on. Turning off your cellular data will make sure you’re measuring the voice signal, from there I would follow the steps in this blog article which I wrote for another site. Make sure you have signal levels of -110dBm or higher (lower numbers of dBm are better, so -90 is better than -110) in order to get the best result. 2. There’s a problem with the cable or connection. This is quite possible as well. If you have a multimeter you can test the wire by touching one terminal to each of the center connectors, and then test for a short by touching one terminal to one center connector and the other terminal to the other wire. Or, get this cable tester which is easier. 3. It’s just not hooked up. Don’t be ashamed, this happens. Sometimes you don’t tighten a connection up and it doesn’t quite connect. Loosen and re-tighten all the connections. If none of those things help, there may be a problem with the booster itself, which is rare but of course it does happen. From there, you can call us at Solid Signal at 877.312.4547 and we’ll be happy to try additional steps or exchange out the unit if that’s really what it takes. Still not bundling? Why not?